My back-up grilled pizza recipe was inspired by the potato leek soup my dad used to make when I was a child. In addition to leeks, we received potatoes from the food collective this week. Andrew sliced and grilled these and set them aside. Again, I sprayed canola oil on the rolled out dough and laid it on the grill pan, let it cook for a few minutes and then flipped it. We did a team assembly of the pizza, topping it with marinara, Fontina and mozzarella cheeses, the leeks and potatoes. Both pizzas turned out great! I was worried about burning the dough, but I made sure to keep a close eye on them and all turned out well. The grilling pan we picked up at Bed Bath & Beyond especially helped. My pizza crust is typically thin and crispy, but on the grill it was even thinner. It seems that cooking on the grill allows more air to penetrate the dough, ultimately creating a lighter and might I add tasty grill flavored crust. To top it off, the cheese melted just right and the flavors really jumped off both pizzas. 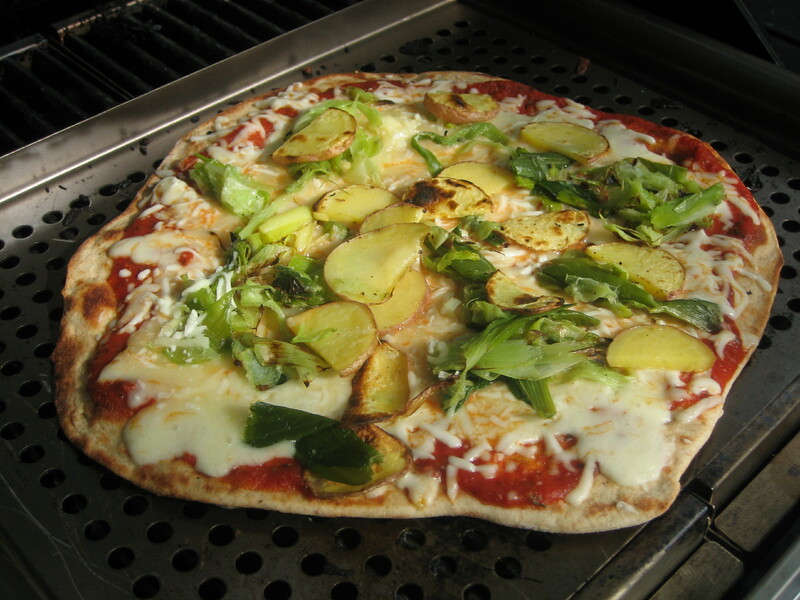 I will definitely be creating a few more grilled pizza recipes to enjoy in the last weeks of summer. I’ve been told that grilled pizza is all the rage. So, I finally convinced Andrew we needed to buy a barbeque grill so we could get in on the fun. I was pretty nervous about attempting a grilled pizza because I have no experience grilling anything. 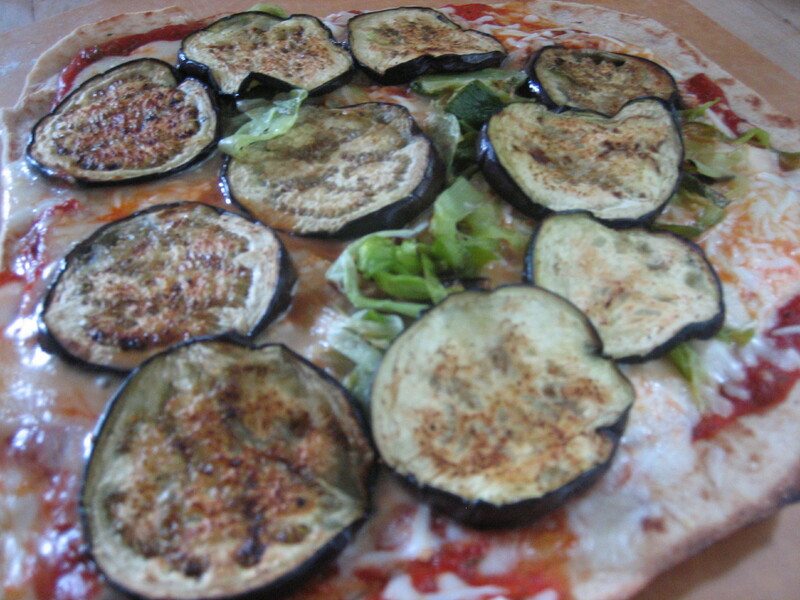 In the case that we screwed this up, I created two pizza recipes this afternoon. Eggplants and leeks came in our food collective this week. Andrew grilled these veggies and set them aside. I rolled out the dough, then sprayed it with cooking oil and laid it on a grill pan for about three minutes. Andrew and I carefully flipped the dough and then assembled the toppings, which consisted of marinara sauce, fresh oregano, Fontina and mozzarella cheeses, and finally the grilled veggies. After about four minutes on the grill we transferred the pizza to a different pan and set it on the top rack of the grill to let the cheese melt while we made the other pizza. Check out my next blog entry for details on the results!